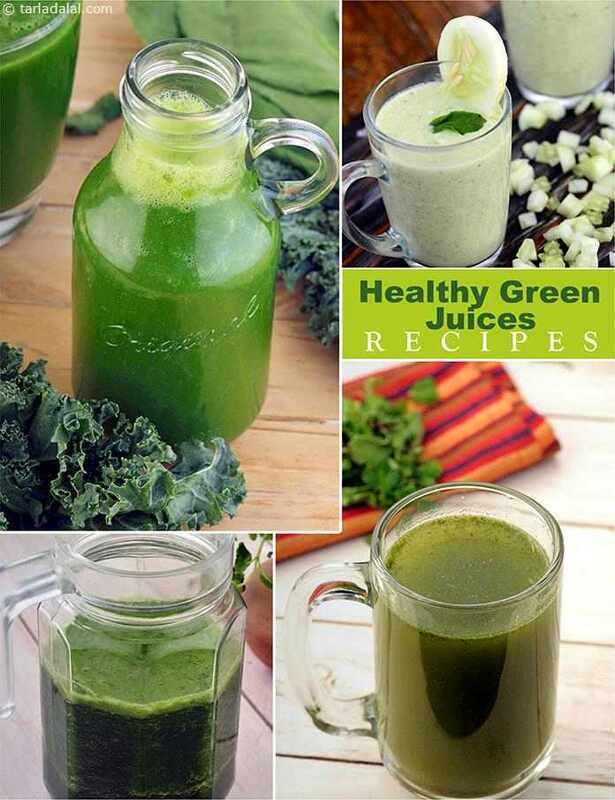 Here is a super collection of Healthy Green Juices. Each juice we have chosen has ensured there all vegetabels are healthy and have a low glycemic index. The net result is that you will have a slow release of energy over time and your blood sugar will remain constant. That is the way for weight loss and a healthy life style. At the Tarla Dalal office, this Palak, Kale and Apple Juice is made daily. Kale is considered by experts to be one of the most nutrient-dense ingredients in the world, and fortunately for us, it is tasty too, especially when you choose the mildly-flavoured, small-leaved variety. The ingredients are rich in Iron, Vitamin C and High Fiber, which makes it a nutritious snack for weight-watchers. You will find our articles on Fresh Juices, Healthy Indian Drinks collection interesting. See what Indian's are drinking. Very few of you might have considered making a drink using cucumber! This perfect invigorating drink along with calcium rich low-fat curds delicately flavoured with mint. Cucumber and low-fat curds blend perfectly to create a low-fat cooler.